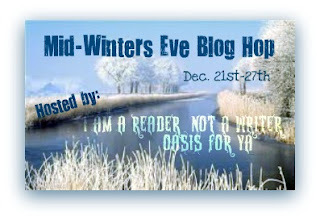 There are so many blogs participating in the Hop. You will find some nice book related items being given away. There is a linky at the end of this post. After you've entered here, hop on over to the next blog on the list and keep going as long as you'd like! The more you enter, the more likely you are to win. I want to thank all of the hosts of the hop. Kathy From I am a Reader not A Writer and Jessie Harrell from Oasis For YA & The Daily Harrell. Contest ends on 12/27@11:59pm Eastern. Winner will be chosen by Rafflecopter and will have 48 hrs to respond to my email or a new winner will be chosen. See rules on Rafflecopter widget. PLEASE VISIT ALL OF THE OTHER PARTICIPATING BLOGS. Thanks for the giveaway! Your post have been fun to follow! Thanks a lot for the giveaway and Merry Xmas! Great contests being offered! I have signed up for some of them here today! Thanks for offering these awesome prizes!